Handbook of Human Rights Investigation, 374 pp. The Handbook of Human Rights Investigation is a comprehensive guide to the investigation and documentation of serious abuses of human rights and violations of international criminal law. Experts in the field have been uniform in their praise for the Handbook of Human Rights Investigation: “Professor Groome has put together an impressive and thoughtful compendium of best practice in the investigation of human rights and humanitarian law violations…I commend this book to all who are or will become engaged in this growing and important field.”Justice Richard J. Goldstone “The Handbook is a comprehensive guide for human rights investigators. It is practical, accessible and an invaluable tool for those committed to doing thorough documentation of human rights abuses.”Salil Shetty – Secretary General, Amnesty International “This handbook will serve as an essential guide to human right investigators. 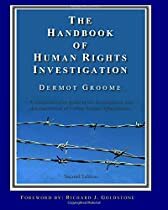 In this updated volume, Dermot Groome, a highly experienced and regarded international criminal prosecutor, has brought together the practical knowledge necessary for investigating human rights abuses. Just as importantly he has placed this highly useful information in an understandable and clear legal and ethical framework. I am glad to highly recommend the Handbook; it should be by the side of all those involved in human rights investigations in the future.”David Tolbert – President, International Center for Transitional Justice “One of the most acclaimed monitoring manuals….”Jonathan Horowitz, One World Research “Considered a cornerstone text by many leading human rights investigators and activists.”The Humanitarian Law Centre “The First Edition of Dermot Groome’s Handbook of Human Rights Investigation established itself as an indispensable tool for the human rights investigator.The Second Edition surpasses it, and cements Dermot’s reputation as an attorney/investigator who can clearly and concisely explain how to conduct these complex and difficult inquiries. The Handbook is an essential guide for human rights investigators worldwide.”John Ralston, Institute for International Criminal Investigations “Groome uses his extensive experience in investigating and prosecuting heinous crimes to provide a step-by-step guidebook to anyone investigating and documenting human rights abuses or violent crimes – a ‘must have’ for anyone interested in the field.” Dr. Kelly Askin, Open Society Justice Initiative The Handbook of Human Rights Investigation is a comprehensive guide to best practices in the field of international criminal investigation and includes the following topics: an overview of the relevant law; an overview of the investigative process; the documentation and collection of physical evidence; the documentation and identification of physical injuries; interviewing witnesses; the identification of suspects and the writing of investigative reports. The Handbook has two appendices; Appendix A is a compilation of 20 commonly used investigation forms and Appendix B is a collection of important international instruments and protocols including model procedures for autopsies, investigations into massacres, torture and the disinterment of mass graves.